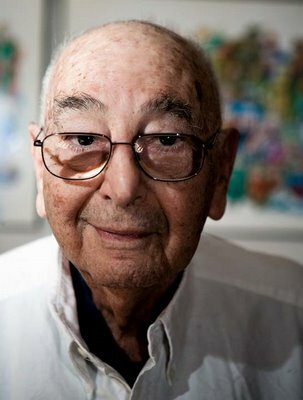 Joe Simon, icon and legend of comics, passed away last week at the age of 98. Truly, it can be said the golden age of comics and comic creators is at an end. When others were consumed with creating the latest strange visitor from another planet, Joe Simon, often with greatest comic artist ever Jack "King" Kirby created heroes who were men, albeit with special gifts. Joe and Jack's greatest creation is Captain America, which finally achieved box office success as a movie this year. Joe was finally able to see a big budget film for his creation. Joe also was part of creating the Sandman, the Newsboy Legion along with the Guardian, and Manhunter. He was one of the most prolific writers of his time, and will forever be associated with his patriotic creation of Steve Rogers, the everyman who became an icon for a country. Joe Simon stood up for Captain America, chastising the idiots at Marvel when they decided to kill him off a couple of years ago, saying, "this is the time when we need Cap the most." Before Captain America was the star of last summer’s blockbuster movie, he was a comic book superhero. The man who co-created the character over 70 years ago, comic book writer and artist Joe Simon, passed away this past Wednesday in New York. Two months earlier, Simon spoke at New York Comic Con, a convention for fans of comic books and popular culture. It was three days after Simon’s 98th birthday, and as he entered the meeting room at the Javits Center, the enthusiastic crowd sang “Happy Birthday” to the comic hero creator. The cover of the first issue of Captain America shows the character and his side-kick Bucky fighting Nazis, with the Captain himself socking Adolf Hitler on the jaw. Looking at the illustration now, it’s easy to write it off as typical American wartime propaganda. But look closely at the issue date. Newsstand comics were routinely dated two or three months later than their actual publication date (so issues that lingered on the shelves unsold wouldn’t appear to be outdated). With a cover date of March 1941, that first issue of Captain America was likely created in late 1940 or early 1941. The U.S. entry into the Second World War was nearly a year in the future. When Simon and partner Jack Kirby were looking for a villain for their new comic book, they didn’t have to venture into the realm of fantasy – there was horror enough arising in Europe. Concluding that the best comics were the ones with the best villains, Simon thought, “Let’s get a real live villain.” Hitler was the obvious choice. As Simon wrote in his autobiography, Joe Simon: My Life in Comics, “We knew what was happening in Europe, and were outraged by the Nazis – totally outraged. We thought it was a good time for a patriotic hero.” And thus Captain America was created to go up against the rising Nazi threat. Simon and Kirby did give Captain America a fantastical opponent — the Red Skull, the idea for which came to Simon as he watched hot fudge dripping down the ice cream on a sundae. Simon was struck by how the pattern of the fudge looked like arms and legs, and he began to imagine a new villain – one who oozed all over the place and could be called Hot Fudge. He quickly rejected that idea. He then realized the cherry on top of the sundae resembled a skull and thought, “Red Skull … that sounds good.” And Captain America’s arch-villain was born. Simon went on to create other remarkable heroes and villains, many in conjunction with Kirby. The team developed the Sandman, the Blue Bolt, the Newsboy Legion, the Boy Commandos, Manhunter and many others. The pair also worked in a wide range of genres beyond superheroes, including titles focused on crime, war, romance, western adventure, horror and humor. Simon was one of a number of early comic book creators who later fought for the rights to their earlier work. As Captain America continued to generate revenue through comic books and other forms of popular entertainment, Simon sought to reclaim the copyright to the character. His legal battle with Marvel over Captain America was eventually settled out of court. Throughout his career Simon seemed intrigued by what makes someone a hero. It was a fascination that began early in his life. The version of the story Simon spun at New York Comic Con was long and rambling, often skipping around from point to point. But, even if his narrative did meander, his memory of the event — after close to a century — was clear and sharp. To the admiring audience, he must have seemed much like the character in his own story: aged — even a bit doddering – yet still an icon of an earlier era of heroism. Joe Simon gave us a hero who just wanted to fight bullies and represent his country. He gave us a hero who could be us all and who represents the best of what America was, is and will be. I hope, in the future, that others will carry Captain America as that great American hero. His cocreator, in his own way, was just as much of a hero who defined what he himself was. Just like his hero, Joe lived through some amazing times that defined him, but that he helped define as well. Godspeed, Joe Simon. Tell Jack we said hi, and I know you guys are creating some awesome comics in heaven.